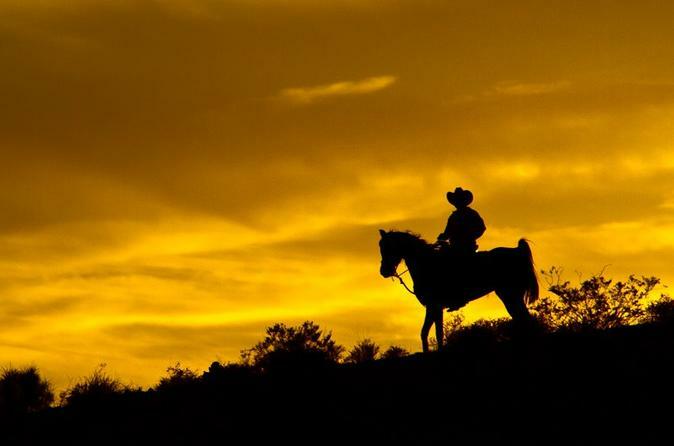 Your friendly and knowledgeable driver will pick you up from select Las Vegas Strip hotels for the 45-minute ride to the ranch for your sunset horseback riding adventure! Let the professional wranglers match you with the perfect horse. On your horseback trail ride, you will ride through the Southern Nevada desert, surrounded by mountains and Joshua trees. If you are lucky you may catch sight of big horn sheep, road runners and jack rabbits. The ride is approximately 1.5-hours. Dinner will be served in the country-style ranch house - Your choice of chicken or steak, baked potato, corn on the cob, rolls and a slice of good ol' American apple pie. Your evening concludes with relaxing around the campfire under the bright stars of the Nevada desert (weather permitting). You will be returned to your hotel with plenty of time still left to enjoy the legendary night life of Las Vegas. Special Offer - Book and save 7% compared to other travel sites! - Book Now!